Cool Cats uses the term '4-Beat' to describe a base dance pattern and structure, originally derived from Swing, that may be used to dance to most music in common (4/4) timing, particularly those styles influenced by the Blues. The dance is known by many names including 4-Count Swing/Jive, North American Jive, Country Swing, and 4-Step Rock. In many respects the choice of name reflects the music and subsequent characterisation of the dance, rather than a significant difference in actions. Due to the versatility of the footwork and rhythms, 4 count patterns adpated from the structure and content of Swing were used by dancers during the Swing & Rock 'n' Roll era to dance to a broader selection of music. '4-Beat' continued to morph through the disco period of the 70's into the Hustle and more recently into Ceroc, with heavy influences of latin dance actions and styling evident (particularly those of Meringue and Mambo). While sharing a common swing background, these modern forms of 4-Beat are thus discernibly more latin in characterisation and structure than of Swing or Rock 'n' Roll. 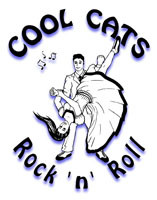 Remaining true to the Blues heritage of 4-Beat, Cool Cats approaches the dance according to the movement, patterns, and stylings of Swing and Rock 'n' Roll. From this foundation students are encouraged to explore advanced footwork and further Blues based rhythms such as funk, hip-hop, and soul to establish their own styling, musical interpretation, and accentuation. 4-Beat is a flexible and expressive dance style and we want every dancer to find their groove! Country Swing = Circles. Very similar in movement and action to 4 Step Rock 'n' Roll, seen here with an emphasis on liftwork. 4 Count Swing is similar, with a linear action and slower rhythms. Swango Blues = Lines. This mix of 4-Count Swing, Blues, and Tango is very similar to 4Beat Blues though we do not include the Latin elements (very easy to do though!). Blues = Timing, Rhythm, & Body. This clip highlights some of the body movement and timing variation available through traditional blues. You can also see how the original blues actions provide a basis for later incorporation and transition through swing and rock 'n' roll styles. What is 4Beat Blues? How is it different to other dance styles? Little written or videographed history of Blues dancing exists from the late 19th century when it began. While blues dancing was popular in clubs and juke joints, there were few (if any) clear rules. Blues was an improvised dance using different stepping patterns, with a focus on close connection. Due to the popularity of the music and the dance, blues actions worked their way into the different dance styles that followed - Swing, Rock 'n' Roll, & Rockabilly. 4Beat Blues is that first step from vintage Blues dancing into a more defined (4Beat) pattern of footwork that developed in different ways, in conjunction with other influences, into these dance styles. Why would I prefer 4Beat Blues to other dance styles? Improvisation, musicality, footwork, body movement and the capacity to dance to almost any piece of music - what's not to like??? In addition, as a 'base' style for Swing, Rock 'n' Roll, and Rockabilly the basics are not only very easy to learn, but allow you to use what you learn to develop into any of the other styles we teach. How energetic is 4Beat Blues? 4 Beat Blues is an extremely versatile and diverse style - how much energy you put in is up to you. It may be danced to (very slow) traditional blues music, to (fast) rock 'n' roll and rockabilly music, or use half-time actions and counts to dance to (very fast) music of almost any tempo. In our classes we tend to focus on slower blues music to learn footwork and mid-paced rockabilly or swing music when working through figures that require momentum or counter-balance.